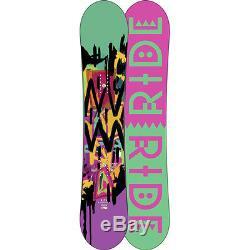 Ride OMG Womens Snowboard Hybrid Rocker All-Mountain Freestyle New 2014. Ride OMG Womens Snowboard 2014. The OMG is a great all mountain freestyle board for the ladies with a true twin centre stance shape on a hybrid camber board. The camber is a standard'microcamber' centre section with just 2mm of regular camber blended into reverse camber nose and tail to give great float in pop with lots of pop. A great one for the girls whether you want to charge down a piste or get inverted in the park. Base Colours Vary, we cannot guarantee the image you see with be the exact board you will receive. Thin Con - Thinned out construction for reduced weight. Hybrid Twin - Micro camber between the feet with reverse camber nose and tail for a catch free ride. LSD - Ladies Specific Design, designed around a womans body to work specifically with the female frame. Pop Rods 1.0 - Urethane rods wrapped in carbon inserted into the core for great rebound and pop. Slimewalls - Made from skate wheel Urethane to improve dampening from unwanted vibrations. Carbon Array 3 - Carbon stringers in the nose and tail to improve edge to edge response and reduce chatter at speed. Cleave Edge - 50 % more edge to prevent snapped rails. Hybrid Glass - Three layers of fibre glass laid up on different axis to give extra strength and response. Fusion 4000 - High grade sintered base which runs fast! Order before 3pm for Same Day Dispatch. This product has no reviews yet, however see what our buyers say about our other products.. Arrangements can be made if you require your goods urgently, however, there may be a significant increase in cost based on the courier tariffs. Please note if ordering on a Friday, you order may not be delivered until the Monday or Tuesday of the following week. The Board Basement can deliver products below 2kg weight to anywhere in the world. If you do not have these details available then pass on as much information as possible on a covering letter. The Board Basement online snowboarding store was born out of a simple idea - help people fight against the growing cost of doing what we love to do. We are small company but we are all keen snowboarders so we understand what is important - quality gear and great prices. We also have new in season stock for products that always sell out. So we are continually searching and finding the best deals around and then passing them directly on to you, our customers. The everchanging opportunities that come our way mean that where something may not be available one week, it is the next, so please keep in touch. Every week and most days we load new products. The idea came out of another successful business we created called Urban Surfer based in Exeter, Devon; Urban Surfer was well known and respected, not just locally but across the UK and Europe. With this comes over 20 years experience in the Snow and Surf industry as well as years of being boarders ourselves. This means we have a stack load of contacts to get the best deals for you. Treating customers, as we would like to be treated ourselves is one of key beliefs and the foundation of our customer service. If you live in Exeter, or the South West of England please feel free to come and visit the warehouse to see/try our Snowboards, Snowboard Boots, Snowboard Bindings, Ski Snowboard Goggles, Ski Snowboard Gloves, Skate Shoes, Dakine luggage and backpacks, Sanuks or any of our other products. You may also be interested in.. The item "Ride OMG Womens Snowboard Hybrid Rocker All-Mountain Freestyle New 2014" is in sale since Thursday, January 9, 2014. This item is in the category "Sporting Goods\Skiing & Snowboarding\Snowboarding\Snowboards".